The first, simple house of worship in Amesbury, Massachusetts, which measured only 25' by 30', was built in 1665 at Bartlett's Corner (now Union Cemetery on Haverhill Road). Within fifty years, the growing community needed a larger structure. 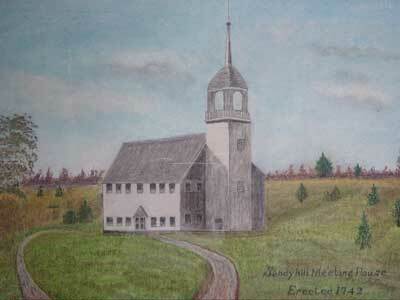 The Sandy Hill Meetinghouse, built in 1715, was originally located on Martin Road. In 1761, the meeting house was carefully dismantled, moved and reconstructed in its new location across the street from Union Cemetery, not far from the site of the first 1665 church. By 1830, with the advent of new churches in the vicinity, membership began to dwindle. In 1835, the last minister of the Sandy Hill Meeting House, the Reverend Benjamin Sawyer, moved to the new Rocky Hill Meetinghouse. The Sandy Hill Meetinghouse fell into disrepair and was demolished in 1848.